Today, at the Microbiology Society’s Annual Conference in Liverpool, scientists will reveal how Arctic microbes are increasing the rate at which glaciers melt, in a process not accounted for in current climate change models. The research, led by Dr Arwyn Edwards from Aberystwyth University, focuses on a grainy, soil-like substance found on the surface of Arctic ice known as cryoconite, which is made of dust and industrial soot glued together by photosynthetic bacteria. Working on Greenland’s ice sheet, the team showed that cryoconite darkens the surface of the ice, causing it to melt and make small water-filled holes. The bacterially-made granules self-regulate the depth and shape of these holes to maximise their exposure to sunlight, which in turn further melts the glacier’s surface ice. In summer, cryoconite holes pockmark the surface of the biologically productive region of the Greenland ice sheet, an area ten times the size of Wales (200,000 square kilometres), which is expanding as the climate warms. Persistent melt in 2008 lifted the snow cover from a low-lying area of Greenland’s ice sheet, revealing a rough terrain crossed by melt water streams. Working on an icecap in Svalbard, in the far north of Norway, the team showed that this process is driven by a single species of photosynthetic bacteria, from the genus Phormidesmis. 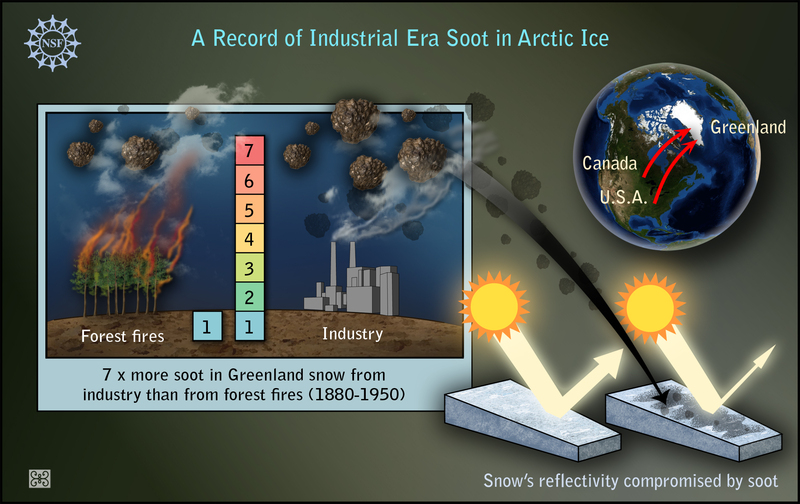 Arctic ice reflects about 60% of the sunlight that hits it (known as its albedo level). The cryoconite decreases the albedo of the ice to around 20%, transferring more solar energy to the ice and melting it faster. This bacterial-led albedo reduction is greater than that of dust alone. Working on Svalbard, the group showed that the extreme environmental conditions of the glacier had less of an influence on the communities of microbes present than the effect the microbes themselves had on the melting of the ice. The melt holes that this one species of bacteria form provide an environment for other microbes to flourish, leading to the growth of the cryoconite holes. Dr Edwards said: “If we recognise ice surfaces as a living landscape we can see that the microbes themselves are able to change the glacial surface. It’s only recently that we’ve begun to understand that these cryoconite holes are dynamic, changing in size and shape. Microbes are capable of ecosystem engineering and respond to changes in their environment all the time. Current models are unable to account effectively for the impacts of microbial growth on glacier and ice melting, so learning more about this Arctic ecosystem and the feedback is an important step to understanding future sea level rises. Are You Genetically More Hunter Than Farmer?